Masters of the Universe #12, “Lifetime,” is by Caragonne, Wilson, and Bulanadi. Here, Adam must find the Power Sword, which has been sent thirty years into the future, where Skeletor rules. Oh, how I’ve been waiting for this one. After a little bit of a weak start, this turns into an astonishingly fantastic issue. Caragonne borrows from the 1987 film to put Skeletor in control of Grayskull by means of the Cosmic Key – and then he pulls out all the stops, imprisoning and killing off whomever he pleases, and making his dystopian Eternia an extremely compelling, high-stakes place. The suspense and urgency are palpable on nearly every page. Caragonne gives us more good development of Adam and his struggles with his identity and reputation, but much like issue #10 did with Teela, doing so highlights the fact that there’s no good reason why Adam can’t tell his parents his identity. Caragonne does a solid job with other characters here, too, especially Randor and Marlena. 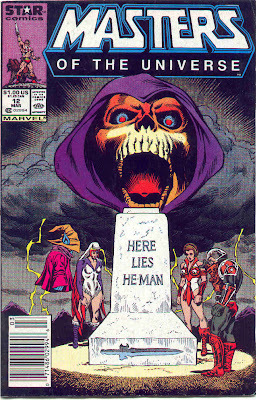 He even addresses the ramifications of Eternia’s growing hero population and overdependence on He-Man. Wilson and Bulanadi turn in the usual quality work. Their facial expressions go a long way toward setting the tone of the issue. And Wilson even thought to make the future Adam taller. The only criticism is that some of these future characters, who should be in their late forties at the very minimum, don’t look near old enough. In all, on the strength of its well-realized premise, “Lifetime” must rank among the greatest He-Man stories ever told, in any medium.